Thank you so much, Olivia! I've been using the hook for a couple of days now, and it's awesome. It isn't scratchy, and more importantly, the glitter hasn't come off on anything. Yippee!! Do you put the hook right in the oven??? Hi Jessie! Yep, I did. It's not a problem with aluminum hooks. I wouldn't do this with a plastic hook, or a wooden one though. Good question! 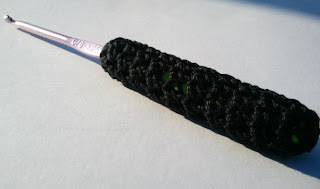 So how did you do the crochet cover? Hi theborn2live! It's just a tube of single crochet. Really simple! 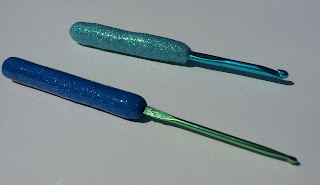 I didn't do a pattern for it, since it really depends on the diameter of the polymer clay handle.